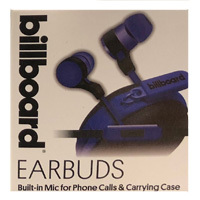 Add trendy hues to your music enjoyment using these lovely blue earphones from Billboard. Plugging into most phones, tablets and computers from its universal audio jack, the earphones play your sounds and songs in rich quality. Featuring a in-line hands free microphone with answer button for incoming phone calls, these earbuds are perfect for using at the office, in your home or while on the go.